Gender roles are obviously well entrenched in Amish society, although that does seem to be changing gradually. There was an Amish woman I met in Geauga County recently who sounded a very unusual note when she told me that she liked to “focus on running the families businesses and not staying home and cranking out babies.” Yes, those words from an Amish woman. Combine sugar, flour, salt, and baking soda in large bowl. Sift in cocoa powder, and whisk all together. Make a well in the center of the dry ingredients; add oil, vanilla, vinegar, and water. Mix until thoroughly combined into a smooth batter. Pour into a greased 9 x 13 pan and bake 30 minutes, or until toothpick inserted in center of cake comes out clean. Cool completely, then frost. Also, there is another recipe that would be common in a Mennonite kitchen especially if happened to be short on eggs. 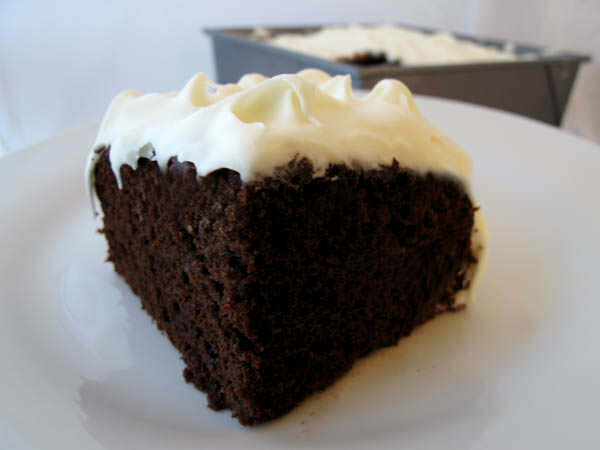 ake this cake and use the fluffy white frosting recipe from a Mennonite woman in Virginia which appears below. Add wet ingredients and beat well. Delicious with any fluffy white icing. Stir together first six ingredients over simmering water in double boiler. Leave until clear. Remove from heat. Add egg whites and beat awhile. Put back and beat 3 minutes longer or until you have semi-stiff peaks. Can be put on cake while frosting is still warm. What’s Next for Bergholz “Amish”? LOL – I love the name. It makes me want to try it even more. Sounds great!! Wow! She is outspoken and if the truth be told there may be a lot of other women who feel that way. The reason for the name of this cake is because you can mix it the baking pan..hence saving a dish. There would be no mixing bowl to wash!! Call me old-fashioned,but I hope that Amish women in general keep their traditional roles and values.Society is on a downward spiral as it is!! (My 2 cents worth). This sounds like a recipe that my Great grandmother used to make she called it screwball cake though. In her recipe you mix the dry ingredients in the cake pan, make three wells in the dry ingredients pour oil,vinegar, and water in each mix up and add vanilla. we always ate it without icing, just a cold glass of milk. We called it Chocolate Atomic Cake, because of the reaction of the baking soda and vinegar. Mom couldn’t get the frosting made fast enough before we started eating it, so she gave up! In fact, I just made it last night for a co-workers birthday! An easy dessert to make, it can be baking while you eat supper and have warm chocolate cake and ice cream for dessert!! We used to make this in a pan, This the best. It was called a snacking cake. It is so good. Yep, “snacking cake” is another name…this is a cake with many names! Is it baking soda or baking powder? Also it looks like there are Choc. chips in it too. I seem to remember a similar cake that my mother used to make, only it was called a “Wacky ” cake. It was very good. RE: Lazy Woman’s Cake Similar to a cake that my mother made that she called “Eggless, Milkless, Butterless Cake”. I have also heard it called “Depression Cake” She always added raisins. I’m sure this cake is quite good. I never understood cakes with a whole cup of oil in them. It just doesn’t seem good health wise. Worse is the thought of cakes with mayonnaise in them. I just made bran muffins, the best ever, had only 1/4 cup oil and 2/3rds cup sugar of which I used half Spenda and added extra raisins. So much more healthy to me than the cup of oil. Glad the rest of you are enjoying it but found after baking with lots less sugar when I finally get a piece of really sugary stuff want very little of it. There are ways to bake healthy if you want to. THanks for sharing your thoughts Gwendolyn, healthy and tasty are great combinations! All food isn’t supposed to be about healthy. I opted out of a potluck today because in the past 6 weeks, EVERYTHING I’ve brought has been met with a sniff of “not healthy.” with no thought to the fact that I cared enough to bring it. Several items were from a trip to Canada, and included things not available in the US. So, I spent the money to purchase them, carried them 8 hours home, and then took them to the group. However, even if someone makes it, they cared enough to spend the time to shop and the time to mix the ingredients, clean up the cooking mess…. I have rheumatoid arthritis, and cooking is a chore. If I make something, it IS a big deal for me. “Not Healthy” has developed into outright rude. If someone cared enough to take the trouble and expense to bring something to a social gathering, make the effort to recognize their effort, and be polite enough to try it. Remember that refusing it, causes them unhappiness, and in the grand scheme of things, is that ONE serving going to totally ruin your health plan? As to mayonnaise… I do apologize that your history teachers never properly discussed WWII. With food allergies, it is difficult to properly use food as a teaching tool. I used to use period recipes in class, something everyone enjoyed. Mayonnaise was used as a binder due to the lack of many ingredients, chiefly, butter. Recipes with it can usually be traced to wartime cooking, rather than a desire to add fat to a recipe. Molasses was also used as a sweetener, substituting for the rationed sugar. Extension agents developed many of the recipes, distributing them through classes that taught canning and other cooking techniques designed to support the war effort. When WWII started, the extension service was the only organization with networks that operated on a national, state, and local level. Food is a necessity, but for a vast number of people, it is a very social experience, and their only way of sharing something of themselves. When you sniff and dismiss something as “unhealthy,” you tell that person that their efforts, and by extension, they themselves, are worthless. Consider that thought the next time a co-worker offers you something. If someone cared enough to make the effort,, demonstrate that you care enough about them to take a piece, even if you whisk it into your purse when they look the other way. Hello Gayle Ann thanks for that response… I just figure if you don’t want it don’t eat it… If your looking for a low fat or calorie food don’t go the a pot luck… Or just keep your mouth shut… Just smile and say thank you … I love looking at all these recipes … And how smart people had to be to get things on the table with all the restrictions you had to over come growing up…. Please keep sharing, and just shake your head and pray for those who can’t keep there mouth shut…. These cakes are often a remnant of WWII. Butter was scarce, unless you lived on a farm, and oil, and mayonnaise, were more readily available. Health had nothing to do with it. It was a fat providing moistness. There are several food history books that trace the history of various items. You would benefit from reading them. Cooking, like anything, has a history, and knowing it is important. The Chinese consider knives at the table barbaric, and do all prep work prior to cooking. Most people think of only certain provinces with respect to Chinese cooking, namely the provinces sending immigrants to the west coast to work in the railroad. Frying was introduced by African cultures, which is why it is associated with the American south. Middle Eastern cultures use yogurt and cheese because they had no way to store milk, so they developed other ways to use it. Fruitcakes were the original trail mix, with proteins and fruits. The alcohol prevented molding. Molasses recipes gained favor during the world wars, particularly WWII, as a substitute to the rationed and difficult to obtain sugar. Most food practices have to do with ingredient availability and the creativity of cooks, not a particular concern for health. You are fortunate to live in a time with an abundance of ingredients, but it is wrong to criticize recipes as not “healthy” when they were developed for a different era. Try one, and look at it as a history lesson, not a way to demonstrate your “healthy” habits. Gail, thank you for the informative post, good points! Thank-you, Kevin. Food history is fascinating. One can tell the pathways of colonization through food, both through what was brought back from the country and by what was introduced. I particularly find recipes from the World Wars interesting because they demonstrate the creativity and resourcefulness of cooks. For WWI, Canada and Britain are better sources because American didn’t join until late in the war. Canadians would cross the border to obtain some items. I particularly find colonial cooking interesting, and challenging if reading the original recipes. Often, they include only ingredients, sometimes without measurements. Even if measurements were included, they are vague, such as one teacup of sweet milk. There were/are many sizes of teacups. Between the Civil War and the 1920’s, charity cookbooks were popular. They were sold by church groups or other social organizations, and compiled by the women. They are a rich source of history of the area. Food is an overlooked source of information. Immigrants may have tried very hard to become American, learning English, and adopting American practices, such as 4th of July celebrations, but they didn’t stop cooking when they hit American shores, bringing with them their recipes. Charity cookbooks offer information about immigrant ethnicity, climate, social class, ethnicity, religion, geography, and the societal role of women. What we think of as ethnic food in this country, is often peasant food in the home country. As a rule, the wealthy didn’t leave. They had no reason to leave. Hence, the foods seen in this country as ethnic food contain ingredients which were cheap and abundant. The transportation and technology level of an area is evident in recipes as well. English recipes of the late 1700’s do not contain bananas for a reason, but they do include lemons, which did withstand transportation. As transportation improved, particularly with the refrigerated rail car, one sees recipes that include items generally not available outside their local area, such as bananas, and the movement of coastal seafood inland. Prior to these innovations, geography is evident, as one doesn’t see items like lobster and shrimp in countries such as Afghanistan. Technology also had a more direct impact on cooking, specifically techniques. One moves from a hot or warm fire to specific temperatures, such as a 350 degree oven, to microwave for 1 minute. One can also tract the availability of technology. As items decreased in price and were adopted, the use of them in cookbooks increases, such as stoves and microwaves as well as refrigeration. The 1950’s are great for recipes that include items such as canned pineapple because canning allowed items to be cheaply packaged and transported. A look at cookbooks also shows the role of women, and their social class. While ingredients show what items people could afford to purchase, a recipe also shows the time women had to devote to cooking. Recipes from the 1950’s and 60’s are often labor intensive because women were home. Compare the cookie section of the first Betty Crocker cookbook to the current version. Cookies have changed from items that are art to mix in one bowl and cut into bars. Cutouts and refrigerate overnight are practically non-existent. The sacrificing flavor and quality for time is also evident (the microwave cookbooks of the 1970’s). I dislike the attitude of the last couple of decades that food has to be healthy. When I taught, at the college level, I’d bring in food for every class, and while the boys experimented, girls were afraid of a calorie. How is teaching people to be afraid of food a good thing? I’m not saying eat an entire batch of chocolate chip cookies. Or that one needs a 5 layer cake for dessert each meal. But, start to look at meals as an educational experience. Food is a rich source of history. All aspects of a society are reflected in its food, including efforts to make people fear it. I’m not saying that one needs fried chicken, mac ‘n cheese, and cheesecake for every meal. But, one also doesn’t need to remove flavor it and make it a non-flavorful completely uninteresting. Make one meal a week a history meal, particularly if you have children or grandchildren. The Frugal Gourmet’s books are particularly good for this task, and in particular “Our Immigrant Ancestors.” But, just start looking. Michigan State University has a project called “Feeding America.” As cookbooks come out of copyright, they scan them. Their oldest book is 1798, I believe. And, browsing there is free. If one meal seems overwhelming, or unhealthy, pick one dish… a side dish, or dessert, or the entree, and share the history of the dish. Make dinner a learning experience, rather than something crammed between the drop off by the school bus and music lessons or soccer. Make a cookie for the after school snack, or for a lunchbox dessert, so the history can be shared. And, bake, and take some veggies for the food phobic at the next office meeting. Our Judeo-Christian culture teaches us to not eat with enemies. (Do you eat lunch with the people at work you dislike?) I’m not saying people will melt like butter, an ingredient which also has become a public enemy, but once people are munching, the psychological barrier of not eating with enemies has been overcome. For a unique bible study, get “The Frugal Gourmet Keeps the Feast.” Also a great book for home schoolers who home school for religious reasons. He looked at all foods mentioned in the Bible, and comments, with recipes, on their spiritual meaning, as well as their use in everyday life. I also like his Christmas book. He talked about how, when his boys were young, they would theme meals for devotions. Something that can be done for any holiday, or at any time of the year. For example, if the topic of devotions was angels, they had angel hair pasta, and angel food cake. While he offers ideas, and recipes, with some thought, anyone can think of the ways to do the same thing, much like the Irish meals on St. Patrick’s Day. I don’t think I could have taught at a public school, where a cupcake or cookie are considered as horrible as drugs. Food is such a wonderful mechanism to teach chemistry, biology, history, sociology…. At the end of the semester, one class was a chocolate tasting, from chocolates all over the world… how it is flavored in Mexico compared to Switzerland, and the 100% cacao. I also did a cheese tasting, with goat cheese, sheep cheese, and from around the world. One student was absolutely amazed he liked herbed goat cheese, and many of them told me they would never have tried the items outside of class. I also did purely fun things, such as Mountain Dew cake. When I talked about the Amish, I went to Lancaster, and brought back ShooFly pie, pickles, chow chow, Amish cheeses (from Ohio), whoopie pies… It was about new experiences. One can’t give students these experiences if they are taught to be afraid of food. I also used to give students menus from 8 different restaurants, and they had to identify them by social class and tell me how they differed. Friendly’s, Charlie Trotters (which no longer exists), the Hard Rock, the Four Seasons, Denny’s, Applebees, a local diner, Whole Foods… I’d start by asking them what was the single most important factor that influenced where they would eat. Then they compared the menus, in terms of how the menu was design, physically (wipe off laminated plastic vs, easily changed parchment paper inserted into a leather holder, pictures, descriptions of food), and then the actual food items offered. Think about it. It is an interesting lesson. Another exercise was to visit area groceries. The NYC metro area offers choices. They had to visit groceries in the inner city, upper income neighborhoods, and middle income areas, of the same chain, when possible, and compare them. A guest speaker was from a foodbank. She talked about how people would clean cupboards, and then give the food to the pantry. Again, if you won’t eat it, why would someone else? Pantries, by law, can’t use expired food, so essentially, someone gave something to look like they were donating, but they were just making the pantry responsible for disposal. The oldest item they had was something someone had donated that was 13 years old. They had it displayed in the pantry. As something older was donated, the item changed, but at that time, it was something 13 years old. No doubt much much much more than you ever wanted to know. Food is an incredible teaching tool. Reducing it to dog food, in terms of something plain and uninteresting, and just something necessary to live is so wrong. There are some great books that use if for science and chemistry lessons. Just look at some of the home schooling sites, or google. When you travel, eat at mom and pop restaurants if you take the time to stop. Don’t eat at a place available in your own back yard. Even Campbells flavors food regionally and offers some items regionally. Stop and look at the grocery store (especially in Canada… Lays has an entire line called “Taste of Canada.” which are flavors not available in the US. Hershey contracts with Nestle outside the US, and one can get flavors like Green Tea in Japan. No need to purchase expensive souvenirs that wind up forgotten after a few hours, just go to the grocery store! Food is an incredible teaching tool. Don’t teach children to fear it. Reach them to try new things, explore its history… it isn’t something to fear.. Teaching people to fear it ruins its teaching power. I always felt so bad for the girls in class who were so afraid of a calorie that they wouldn’t try something new. It’s hard to expose your students to new things when they have been taught that your most important teaching tool is evil. I have a depression cookbook and recipes from my mother and grandmother’s recipes. My sister in law cooked with honey. people can be so rude at times. People need some fat in there diets and some people use apple sauce to cook with. applesauce is great to use for flavoring! I found a similar recipe, years ago, in a Phi Beta Kappa Cookbook. It was called Mix-in-the-Pan Chocolate Jiffy Cake, and made a 1 layer, 8″ square or 9″ round, cake. I liked it because all the ingredients were mixed right in the baking pan, and it didn’t make a huge cake, that would have left overs. It’s very quick and easy to make, for unexpected company, and only makes a few servings.. I’m also a Pastry Chef and use this recipe, to make any flavor cake (with a few variations), and can use it for clients who are allergic to eggs. (I’m going to try it soon for a client who has Celiac’s Disease, with a special flour.) It does not call for baking powder. In an 8″ square, or 9″ round, UNGREASED cake pan, combine flour, sugar, cocoa, baking soda, and salt. Mix together with a fork to combine well. Form 3 wells in the dry mixture and into each one, put one of the following: oil, vanilla, and vinegar. Pour over all the cold coffee. (Coffee enhances the flavor of chocolate, and no, the vinegar will not be tasted in the baked cake. It is needed to react with the baking soda, as a leavening agent.) Stir well to combine but do not overmix. Bake in a preheated 350-degree oven for 35 to 40 minutes. When cool, frost with 1/4 recipe of your favorite frosting. You can bake a 2 layer cake (or 9″ X 13″ cake) by doubling the ingredients. If you are making 2 layers, mix the ingredients in a large bowl, and divide between the 2 cake pans. For the sheet cake pan, mix right in the pan. To make the cake(s) a day ahead, line the pans with parchment paper and spray the sides of the pans well. BEFORE THEY ARE COMPLETELY COOL, cover the cake, in the cake pan still, with a piece of plastic wrap, flip over onto a cookie sheet, lift off the pan, and wrap tightly for up to a day. If cakes can be made a day ahead, they seem to “season up” and get moister, and they are less crumble to work with. VARIATIONS: If you don’t want to make a chocolate cake, omit the cocoa, and substitute another flavor extract for the vanilla. I love to make an orange cake with orange extract and orange zest, or lemon cake with lemon extract and lemon zest. Substitute water for the cold coffee. You could make any flavor you want by modifying the extracts. When I was the Pastry Chef at the Thousand Islands Inn and Conference Center, on Wellesley Island, I used this recipe to make cakes serving up to 150 people. I only needed a large bowl, and didn’t need to use the commercial mixer. I’m a new member to this site, so when I saw the listing for “Lazy Woman’s Cake” in the “Top Recipes” section, I clicked on the link – then had to laugh when I saw the recipe. It’s very similar to the Crazy Cake recipe that was the default birthday cake in my family for years! My mother was far from lazy, but had eight kids to take care of, so I’m sure she appreciated its ease. And it tastes just great. We always iced it with coffee frosting, a long-ago concession to my father, who wasn’t fond of chocolate. I’ve heard the vegan part about this cake, but I love the idea of coffee frosting. Welcome to Amish365, Aimee! We called this cake “Crazy Day cake”. I think it also goes by the name “Wacky Cake” sometimes! Growing up my mom called it Krazy Kake. It was one our favorites since it so quick to whip up. She would whip it up right before dinner was served and it would be done just about as soon as we had dinner on the table. She would sprinkle it with powdered sugar instead of putting a frosting on it. Passed down from my mom it became one of my kids favorite after school snacks with a big glass of cold milk. There is also a vanilla version of this cake. Mmmm, a vanilla version, THAT sounds good! Kevin, What a great bunch of replies for the easy recipes. Love all the information given by the ladies, My Mom used to make the Eggless, Milkless, Butterless cake quite often. That and one called the Brownstone Front cake. Never knew the origins of the name of that one. I used to make the wacky cake all the time when I was a kid. One of my favorite cakes is the Pudding Cake. I call it a picnic cake. Take one small pkg of chocolate cook pudding and two cups milk. Cook over medium heat just until it comes to a boil. Remove from heat and stir in a chocolate cake mix. Add choc chips (optional). Put in a greased and floured 9X13 cake pan. Sprinkle with nuts, choc chips or what ever you choose. Press down lightly. Bake in 350 degree preheated oven for 35 minutes or until tests done. Never needs frosting and its very moist and can be held in hand to eat. Used to make this to take camping. My girls still love it. Keep up the good work Kevin. Been a faithful reader of your column since back in Elizabeth’s time. Thanks for chiming in Judi, always great to hear from you, yes, you have been around this site a long time and I sure appreciate it!! !